I see his face painted on the back of many buses, in the attempt perhaps to boost his reputation and to improve recognition. “Posible,” the advertisements read, that he is the key; he is the answer. “Galing at Talino:” the Harvard Law graduate, the most intelligent in the motley crue of Presidential aspirants, the man with the plan. Gilberto Teodoro, Jr. is poised for the grand prize of Philippine politics: the Presidency. He is the most articulate among them, bringing with him the kind of surprising charisma that turns him into a most enigmatic, charming figure brimming with confidence at every word and spiel. One can make the case of him being the most intelligent: there are brains, in a way, to be glossed over when you do go to Harvard and bring with you such stellar credentials to the Presidential race. Yet perception – the very thing that makes up anything and everything about politics – is reality, and political at that. In Presidential debates, Teodoro finds it difficult to shrug off questions about the President. He parries them, avoids them, dodges them, strings artful responses, and yet he cannot escape them. He is who he is: Gibo Teodoro, the hand-picked successor to Gloria Macapagal-Arroyo. Every parallelism and judgment passed to him because of that is justified and warranted, never mind that it seems “unfair” or “underhanded.” He is Arroyo’s golden boy, and whether that’s a medal on his neck or a monkey on his back is something he has to – necessarily – contend with. 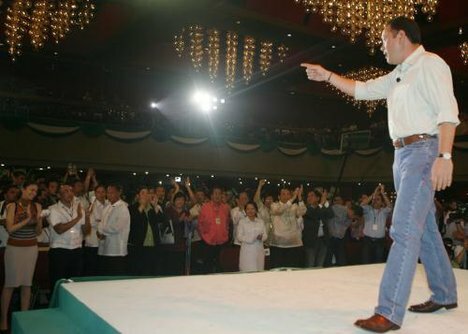 May 2010 is, in many ways, the referendum to nine years of Arroyo, and as the Administration candidate, Teodoro stands right in the middle of representing and defending the status quo. “Loyal” to some, yet in many ways, someone who, by necessity, clings to patronage. Yet the man carries with him too many disconnects that one can only perceive and subsume them to be acts made (only) because of political necessity. He walked the flooded streets to give relief to Ondoy when his own agency was caught flat-footed, glaring at its own mistakes and omissions. He brought in the glitz and glamor of Edu Manzano to bolster his floundering campaign when we all thought it was all about wisdom and intelligence. As Patricia Evangelista points out: the man who did not want warlords in his party accommodated one. Or to bolt from your old party because it is necessary and attractive to survive in the ruling one. Or not to answer questions about Gloria outright so as not to have a 50/50 chance at a surge of popularity or to seem like a traitor: not to answer because it is necessary. Or to change your mind on something like, say, the RH bill, because it’s necessary. Impeach Davide, because it was necessary, and so on and so forth. Method first, right and wrong later, when there’s room for it. Politics based completely and solely on pragmatism, practicality, and the necessary. In a world without a sense of right and wrong, where necessity is the mother of all progress regardless of what consequence it may be, perhaps Gibo would make a great choice. Yet when hunger and satisfaction, when nakedness and sophistication, and ignorance and enlightenment should be – and are – defined by right and wrong and not solely out of a sense of patronage and necessity, it begs me to question Teodoro as he stands now. Yet on the very root of it all, it is – to the most acute – all necessary. The same sense of necessity that came with his predecessor, who found it necessary to cheat, to steal, and to screw the public because survival is the only ethic; that politics is amoral, that it is the art of the necessary. Right and wrong are things that, perhaps, can be set aside. You do not need them when the imperative is to survive. Sad, but in many ways, true. Many things are here because of necessity: the poor are necessary for the rich to gain wealth, that cheating is necessary in elections, lives need to be put on the line for an agenda to be set into action. It’s everyone’s question: will he side with the President? Will he be the next Gloria? Will he prosecute her, or make a move to? While these may seem to be petty, irrelevant questions to those who think they make educated votes, they aren’t to the mass of people who want to know the answer, outside of circuitous artful dodges from Gibo. Compared to the likes of Noynoy Aquino and Manny Villar and Nick Perlas who do things from whatever lens of right and wrong they view the world, Gibo is methodical and pragmatic. Gibo’s political sense of right and wrong is a lot like his predecessor’s: the necessary, and the not necessary. What is necessary is to survive. What is not necessary are nuances of the survival imperative: debatable, optional. Method. right you are. Gibo is Gibo and his GMA affiliation is what slows him down. but i have a lot of faith in him that he will not be another GMA. he doesn’t make any dazzling promises, he only says is that it is all possible. i will vote for the guy, even if i feel he won’t be president. most of us filipinos seem to be attracted to lying and cheating types.